Open Roads is the theme of our blog hop. It's finally summer, and that means road trips! Road trips are all about the tunes, right? Since we enjoyed the last music hop so much, let's make something that focuses on your favorite travellin' tunes! 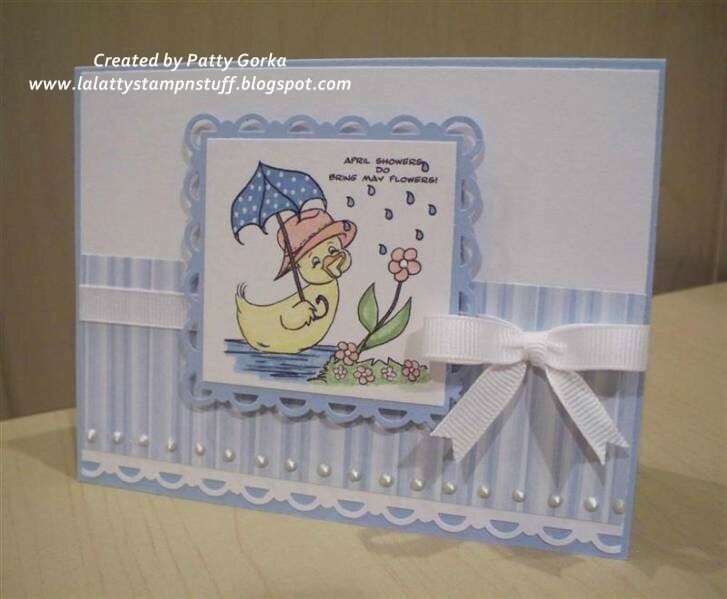 The song I chose for my card is "Raindrops Keep Falling on my Head"! I've had that song stuck in my head all day, and now you will too!! 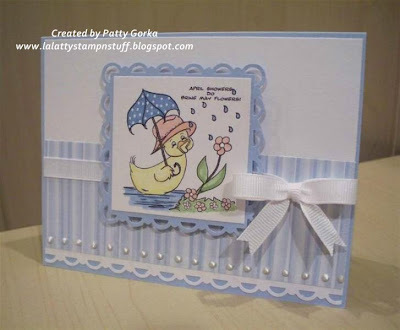 The digi image I used on my card is called Spring Showers. I printed out my digi image, heat set it using my heat gun, and then I colored it using my SU markers. Then I decided to add some white dots to the umbrella using my white gel pen. I made my square scalloped frame by using both my scallop trim border and my scallop trim corner punches. The sentiment reads: April showers to bring May flowers. I hope you like my card! I'd also like to welcome the designers from PaperTemptress to our blog hop. The winner will be chosen from a mystery blog hostess that we don’t even know who it will be until the hop is over…so that’s why you’ll want to leave a comment on EVERY blog, so you don’t miss out! Now, to continue the circle, you will need to hop on over to Linda's blog and keep going until you’ve come back to where you’ve started! Thanks so much for playing along with us and we hope you have a great time! Beautiful card! Lovely color combo, sweet image and great details! Patty this is so sweet! I just love the colors you picked for this little cutie!! AWESOME! AWESOME card. So bright and cheerful even if it is raining!!! What a cute card! Le't hope there will not be to much rain on the road! oh LOVE this song too!! used to sing it alot when I was younger....guess I'll be singing it a lot today too!! hee hee...LOVE your card Patty....giggle....perfect for that song too! Very cute, it almost makes you not care if it was raining, adorable. OMgoodness now I am going to be singing this tune all day long! LOL Your ducky is super cute with her polka dotted "bumper shoot" LOL! Thanks for joining us this month this is super! This is just adorable! I've come full circle... great hop! Great colors. I love the scallop trim edges and the white bow. Very cute card. This is so cute! Love the additional of the perfect pearls! I just love this wonderful design. It's so clean and fresh and perfect for your image. Cuteness!! What a darling card! I remember this song! Oh boy, I am probably aging myself again. Your card is adorable. I love the colors you used with this cute image. This is one of my favorite stamps and one of my favorite songs!! Thank you so much for sharing this with us. Thank you for your time that you put in on this blog hop. Absolutely gorgeous card! Thanks, I now have that song stuck in my head! LOL It rained all day yesterday and today it is 90 degrees. Such a cute card! I love using music as inspiration for cards. Thank you; this is a darling little card. OH my your cards are just stunning :) and this one is just too adorable. I remember my dad playing this in the car when I was a kid! Takes me right back! LOVE the card! Very cute, such lovely colours. This is so sweet. How adorable. Very sweet card....love it. And I love that song. Your card is sweet and that was one of my favorite songs when it came out. Beautiful card, Patty! Love the edge punch you used and the colors are so soft and lovely. Love the softness of the colors and the pearls. Lovely image,too! Awwww, how sweet! Your details are just perfect! I love the soft colors of this stunning beauty! Great coloring! The pearls really top it off! Patty, this is such a cute card! I love the image and your coloring!! !